Here is a small but exciting bath project we did for a client. 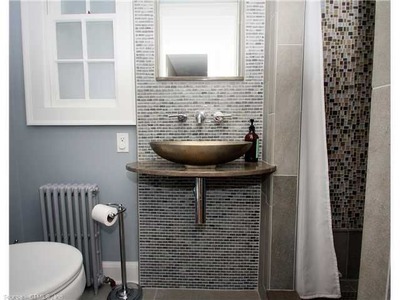 The challange was that the existing bath was a tiny powder room. They wanted to turn the existing bath into a bath with a shower. The current space did not allow for a shower. The solution was to expand the current bath by removing an adjacent closet. The bathroom was so small that it could not fit a standard vanity. Our designer created a one-of-a-kind supporting shelf that could hold a vessel sink. 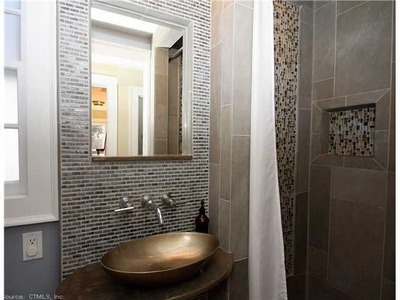 The combination of small mosaic brick tile and a larger format floor and shower tile created a stunning look. Remodeling a small space can be challenging but not impossible.